Tuesday night’s meeting of Council saw the passing of a consent Resolution asking the Province to allow the spring black bear hunt in Wildlife Management Areas (WMU) 46 and 49. This includes the Town of Parry Sound. Two Councillors made the somewhat emphatic statement that there would not be any bear hunting in Parry Sound. Well I’m glad they think that. As it stands now there are no municipal restrictions on hunting or discharging a firearm in Parry Sound. Well you could in theory be charged with a noise violation, but not for any specific type of serious firearm violation. There are more restrictions on where you can smoke in Parry Sound than there are restrictions on where you can hunt or discharge a firearm. And the penalties might be higher for smoking in the wrong place. 1. No possession of a loaded firearm within eight metres of the travelled portion of a road (or roadside fenceline where one exists) at any time AND no discharge of a firearm from or across a right of way for public vehicular traffic at any time. 2. Hunters who handle or discharge firearms without due care and attention or consideration for persons and property are liable to a fine of up to $25,000 or imprisonment for up to two years – or both. Depending on the circumstances, a person may also be subject to charges under the Criminal Code. 3. Some municipalities have by-laws restricting the discharge of firearms. In addition, many municipalities have by-laws regarding dogs, including by-laws that may affect the use of dogs while hunting. Check with the local municipal office for details. 4. A person is trespassing if the person enters onto property or engages in an activity on property where notice has been given that entry or the activity is not allowed. Notice may be given in a variety of ways; some of the common ones are verbally, signs, symbols or fences. Lands under cultivation are also considered to be notice against entry. A hunting licence does not give a hunter the right to enter private property. That means in practice I can hunt for black bear in my own backyard which is in the middle of Parry Sound so long as I am ‘careful’. In theory a licensed hunter could also hunt in my backyard unless I saw them and advised them not to do so, or I posted a ‘No Trespassing’ sign. Our backyard is more woodlot than “area under cultivation”. And yes we have seen a black bear in our backyard, perhaps five years ago. It wandered off after a few minutes. But what about the land around the North Shore Rugged Trail area? What about the land around Darlington Lake? These are all part of the Town and home to black bears. What about the Rose Point Trail? It’s in Seguin Township but welcomes many from Parry Sound. Another interesting factoid, hunting is permitted in many provincial parks, but not Killbear Provincial Park. Yes there is a little bit of irony in the name, but there must be a good reason why the province permits hunting in some parks but not Killbear. Public safety perhaps? There is no assurance that there will be bear hunting in WMU 46 and 49; that will depend on a decision by the provincial government. We have asked to be included. In case you are wondering what defines areas 46 and 49, I have pasted a portion of the province’s WMU map below. 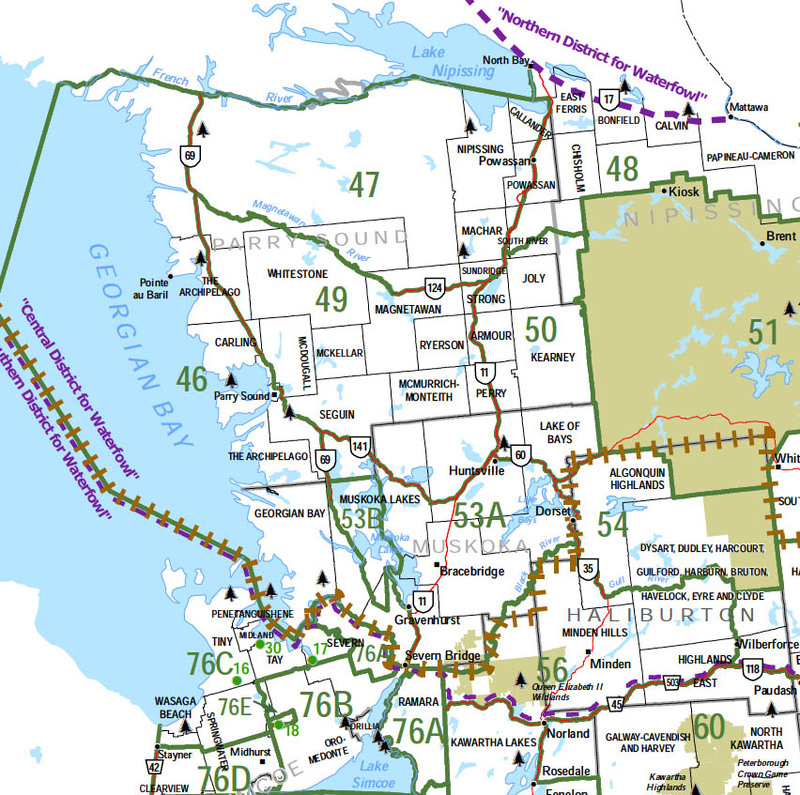 Basically WMU 46 is the area from the Severn to French rivers along the Georgian Bay coast west of Highway 400. WMU 49 is basically the area south of the Magentawan River, north of Muskoka and west of Highway 11. And no, Powassan is not in WMU 46 or 49 as was suggested Tuesday night. Once again, I really don’t have an issue with Council’s decision Tuesday night as long as my safety can be assured as I hike within the public areas of the Town. Should we perhaps have a by-law that formally prohibits hunting within the Town limits? I can’t imagine that the penalty for a noise by-law violation can be that serious. A last thought. In Ontario you are more likely to be killed or injured by a hunter, or while hunting, than by a black bear. Let’s make sure we get the balance right.